Fuel is a big cost in trucking. Most do not give this any thought, and that includes the employees of the trucking companies. If you are the type of driver that thinks about the cost of doing business for your employer or the trucking industry in general, you are in the minority. Just look at all the trucks you see whose drivers speed and tailgate, confirming the bad image the public has of trucks and drivers. Drivers are the ones who can control the cost of fuel with better driving habits, proper shifting, reduced idle times, using cruise control, and letting the truck move on its own, just to name a few. Now none of this is going to help a whole lot if the employer does not have the trucks operating at peak performance, and drivers cannot control wind, road conditions and weight of the load being shipped. Many are now installing APUs. Auxiliary Power Units. These allow the driver to shut off the truck and use the APU for keeping cool or warm. 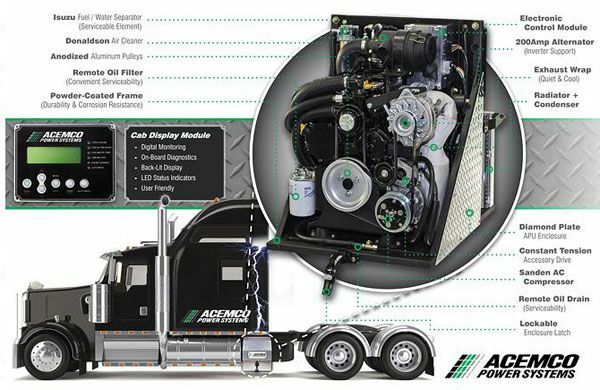 APUs will use around 0.3 tenths of a gallon per hour instead of running the truck which uses one gallon per hour. So you can see that the APUs pay for themselves in a short time. I worked for a company that had heaters only for the drivers. Worked well and I got my much needed rest in a toasty warm sleeper. (For the summer months, to keep the sleeper cool, shut the curtain and the side curtains/flaps and keep the sleeper dark with sleeper air on. During your break, the cool air should last a few hours.) APUs are being installed due to the anti idling rules being more and more common in many states and cities. No one wants you to idle your truck to keep warm/cool. But it is OK for the millions of other vehicles to idle to get the vehicle warm/cool before the driver leaves - and to drive one block because they won't walk it. You know what I mean. This applies to a large number of drivers. I am a firm believer in not idling the trucks or any vehicle, but at times you may have to. There are too many people who know more about trucking than the ones who actually work in the business, and they are the ones who get these laws passed. You can run your truck if you have a pet because it's cruel and dangerous to let the pet suffer and die. So now we know pets have more rights than drivers. Today's trucks are not like in the "old days" - You can shut them off and they will start. What was going on in the past in trucking worked for that time. Today we have better equipment and thousands more trucks on the roads. Let's say your truck has two 100-gallon tanks and you put in 190 gallons twice a week. 190 gallons times $2.85 a gallon = $541.50 or $1083 a week or $4,332 a month. This is one truck. Now you have 100 trucks owned by your employer. 100 trucks put in 190 gallons on the same day, it will cost $54,150! If all 100 trucks fill nine times in a month with 190 gallons, that cost is $487,350! This does not include all the other fills the fleet does; this is just an example. The companies with 12,000 plus trucks - their cost is astronomical each month and at the end of the year. Now add insurance, drivers' wages, maintenance and tires to this cost. 18 tires are not cheap. A December, 2009 ad shows that you can buy one on sale for $299.99. Put eight on your trailer at $300 apiece and you have $2,400. Multiply this by many trucks and trailers in a year's time - again, you can see astronomical figures. Several companies are going to Super Singles or trying them out on some of their trucks and trailers. Instead of eight tires on the back end of the tractor, you have four, and instead of eight on the trailer you have four. Reports show fuel mileage increases of 3% or more due to less weight and better rolling resistance. Mileage per tire also increases. I pulled many trailers with Super Singles in the winter in the northern states. I really like them and did not have any problems. Each company will have to decide if these tires will be the best in the type of operations you have. 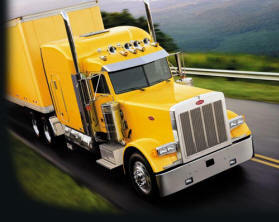 The more money the driver can help their employer save in fuel and tires could mean a pay raise and newer equipment. A single, wide wheel substituted for a tandem (two wheel) assembly. The main benefit of a super single is a reduction in weight and lower rolling resistance which provide better fuel economy. The disadvantage is the lack of tire redundancy (or a 'backup tire' in case of a blowout) from which tandem wheels benefit. A tire blowout is more dangerous with a super single and can not be driven on.